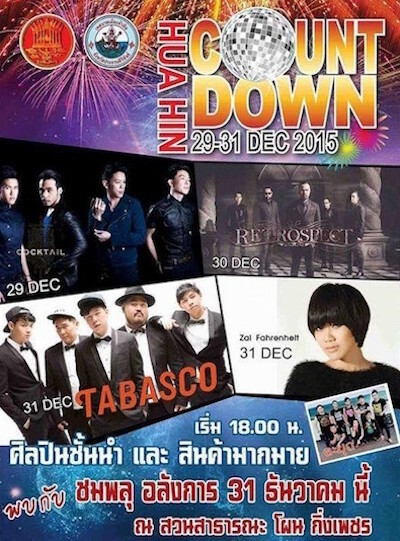 Hua Hin, a seaside town south of Bangkok, is holding a new year's eve countdown tonight. However, one of the posters advertising the event used a mirrorball to replace the 'O', thus inviting people to a "C UNTDOWN". A missing 'o' has caused unintended amusement on various occasions. Some previous examples from Bangkok: "60 C UNTRIES" (Royal Porcelain billboard, with a globe replacing the 'O'), "A C UNTRY WIFE" (Bangkok Community Theatre poster, with a lemon replacing the 'O'), "C unter Service" (retail sticker, with a sun replacing the 'o'), and Bangkok University's "School of Acc unting" (with a ship replacing the 'o').